The goal of the project is to assess the feasibility of rapidly deploying and training health care workers on reusable elastomeric half mask respirators in case of a respiratory pathogen pandemic event. 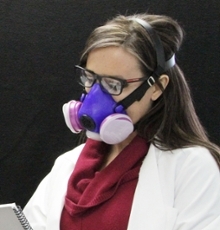 Emory University’s Serious Communicable Diseases Program has been awarded a competitive contract by the National Institute of Occupational Safety and Health (NIOSH), a division of the Centers for Disease Control and Prevention (CDC), to assess the feasibility of elastomeric half mask respirator (EHMR) use in health care. This project is funded in kind by the National Personal Protective Technology Laboratory (NPPTL), the Office of Public Health Preparedness and Response (OPHPR), and the National Center for Immunization and Respiratory Diseases (NCIRD). The goal of the project, as a whole, is to assess the feasibility of rapidly deploying and training health care workers on reusable EHMRs in case of a respiratory pathogen pandemic event. From this, Emory University and the other selected health care centers, Wayne State University and the University of Texas, Houston, will collaborate with NIOSH to develop a blueprint for health care systems across the country. The assessment will include a series of three adaptive and practical protocols. A multicenter clinical trial, “Just-in-time Elastomeric Training and Fit Testing (JET FIT),” will evaluate reusable respirator rapid conversion fit testing and user competency during a simulated public health emergency. One-hundred health care providers (nurses, nurse practitioners, physicians, physician assistants) from Emory Healthcare will train the on use of the new mask during the clinical trial. This study will be followed by laboratory and field protocols assessing disinfection methods and routine use considerations. Colleen Kraft, MD, is principal investigator on the contract. She is an associate professor of pathology and laboratory medicine and infectious diseases at Emory University School of Medicine and associate medical director of the Serious Communicable Diseases Program. Sufficient availability of respiratory protection devices, such as the ubiquitous disposable N95 mask, are crucial for mitigating the spread of airborne diseases and keeping health care workers safe. Reliance on the N95 has led to local and regional shortages during the Severe Acute Respiratory Syndrome (SARS) outbreak in 2003, and the H1N1 influenza pandemic in 2009. Even during many regular flu seasons, the U.S. has faced disposable protective equipment supply shortages.